I received my first “I Want A Letter” request from a nice chap named Mikel. He suggested I write his lady friend a letter, so I did. They have this funny little inside joke about the phrase “Mikel Loves You Though” –which made this request all the more fun for me. Thanks for reading Mikel. I hope Amanda likes her letter! I’m told you have a cat named Catfish—awesome and you can mix a mean cocktail. Total envy! I have to measure all my ingredients (like an amateur) to avoid shaking up something unsuitable for consumption. Thanksgiving dinner is child’s play, but a classic gimlet stumps me every time. I know we’ve never been properly introduced, but you sound like a girl I’d like to know. And you must be quite nice, because you sure have a swell boyfriend—he thought you might like a proper letter. Best of luck finishing school in the “City of Colleges”—a little trivia I learned about Conway, Arkansas. How did a girl from South Korea end up in Arkansas?! I’m sending you some good-grade karma by way of New York. And maybe you could think happy mixing thoughts for me? Your letters are so charming! I’m so glad I came across your blog via Daily Candy. Thank you for making my day, Lauren! I just discovered your project via Daily Candy, and I am hooked. What a clever idea, and your letter writing skills are ah-mazing. After devouring your entries, I chose to comment on Letter 58 because it hits close to home –literally! I live in Arkansas now, after falling in love with the state during my four year stint in Conway, “the city of colleges”. 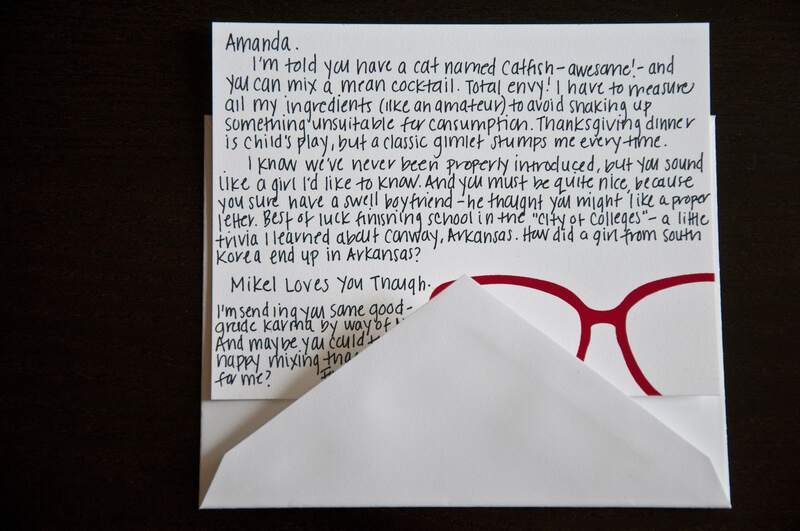 I’m sure Amanda appreciated your thoughtful letter, and I hope she mixed up an extra delicious ‘thank you’ cocktail for Mikel. Thank you again for sharing with all of us your wonderful idea, and thanks for bringing a bit of civility back to the world.